Publisher: SEGA. Developer: SEGA AM7. Released: 1990. Genre: 2D Platformer. We are all well aware that big movie houses love to jump on the video bandwagon, often resulting in spin-off excrement and wasted pocket money. This occurs particularly with the uber-popular franchises with scrupulously unashamed use of company talismans. Ever industrious, Disney has been doing this since the very near beginning of gaming. 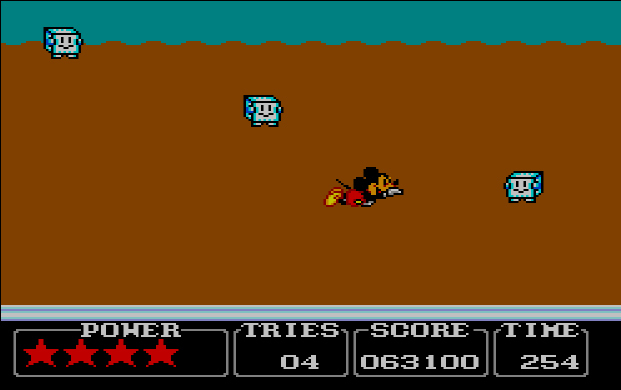 By plonking Mickey Mouse’s infamous mug onto the Nintendo Game & Watch way back in 1980, they have continued with this approach relentlessly with each character in their ever expanding lexicon. 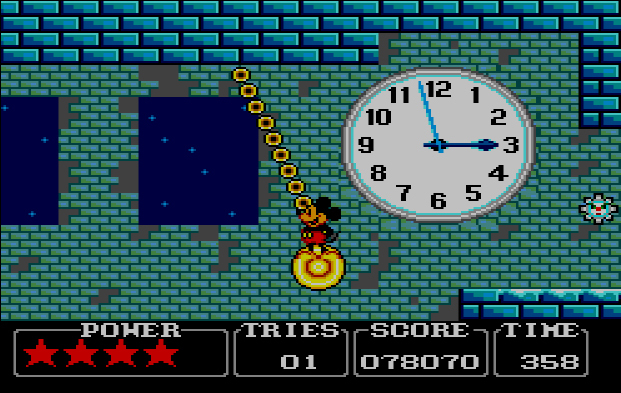 The early to mid nineties saw a throng of great Mickey Mouse titles enjoying the limelight, mostly courtesy of SEGA at the height of their popularity. None emerged as significantly in the 90’s as the Illusion series. Recently given a 7th generation facelift due to it’s nostalgia factor, Castle of Illusion kick-started the series off with a generous dose of Fantasia inspired frolics and magic. 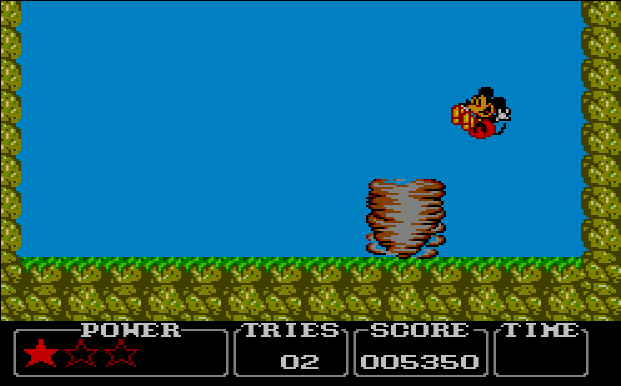 Did the 8-bit heart of the Master System give Mr Mouse the faithful love and attention he so richly deserved? Castle of Illusion typifies the phrase ‘Happy as Larry’. But not the infamous leisure suit persona, more embracing the innocent joy that Disney brings to each and every soul. We have a cartoon caper here that not only gives us a colourful and welcoming environment, faithfully created, but also a game to really test the dexterity of the player. It’s a recipe for a really enjoyable adventure, even if it is slightly fraught by its own, but very few, restrictions. Ever lovable Mickey embarks on a quest to save his love Minnie from the clutches of the evil witch Mizrabel, who apart from having a misspelt jokey moniker, has placed her masters of illusion in Mickey’s path so she can steal Minnie’s beauty and youth. Platforming action in the true Mario trope, there are factors and segments which make this romp individual in its own right. Finding the 7 gems to open the way to the evil hag is the precedence. 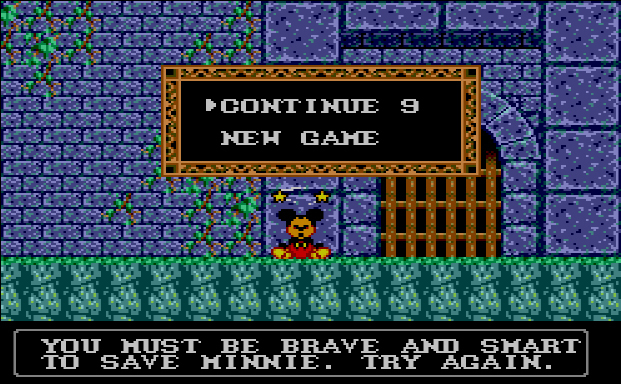 These are found over 5 levels of increasing difficulty, and a final extended 6th level to rescue Minnie and save the day. It’s all implemented and handled rather adroitly by the Master System, seemingly not wanting to give its bigger, more powerful brother the upper hand. In fact, it’s one of those 8-bit classics which step up the level from what you would expect, in the most part anyway. ...Rather than cowardly and stupid. Shape up soldier! Quality animation is clearly a key aspect to all, erm, animated character genres, and the movements and mannerisms of our central hero mouse don’t disappoint. 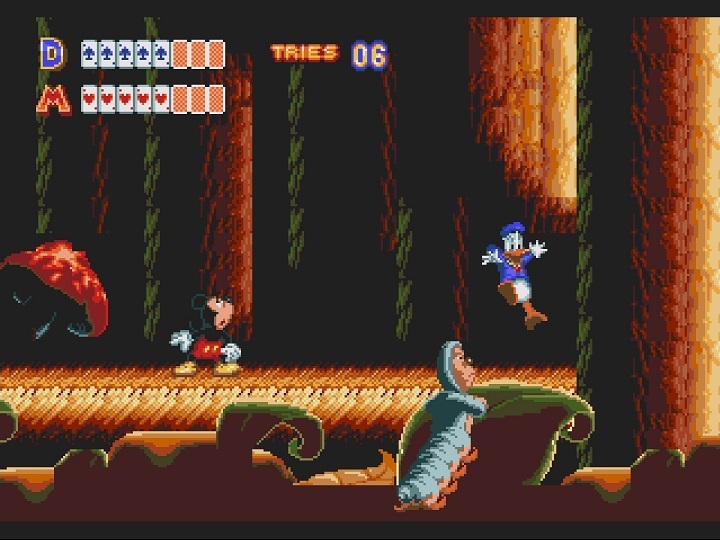 Mickey’s sprite is drawn sublimely and moves excellently, with added comic gestures either from teetering on a ledge or simply standing still tapping a foot. It’s really warming to see this, and helps to immerse you into his surreal mission. His primary attack is another Mario steal, but again places in an amusing twist with the ‘bum bounce’. You really do have to bum your enemies into submission, using it also to reach higher planes or cross wide gaps. Leaving that rather crass analogy behind (!?! 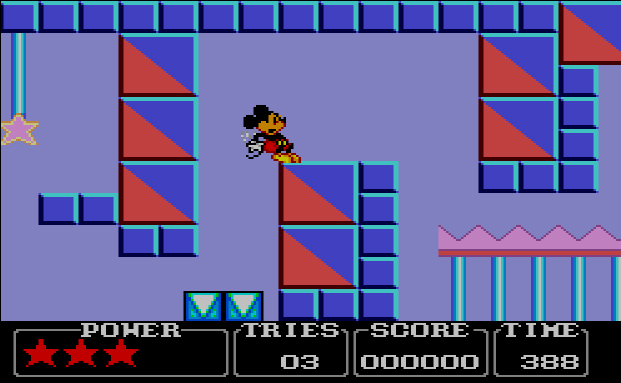 ), Mickey can also pick up projectiles and other items to throw, too gain access to a new area or create a step to access unreachable platforms. This is the platforming foundation, and it’s skilfully done with the combination of enemy types, their attack methods and various puzzle solving elements. All of which makes this outwardly innocent lark quite a tough nut to crack. Parts can be frustrating to the maximum when it’s seemingly impossible to traverse a section without taking a hit, and edge detection can be a little ropey now and then, but never too disheartening; that colourful rainbow of excellently themed backdrops draw you back in, as do the madcap masters of illusion characters themselves. The level bosses all exhibit different wacky forms and tactics, and much like the stages themselves all require you to work out a solution pretty swiftly. They will knock off your energy stars; you get 3 at first but can find more, in quick succession. The giant tree stump and chocolate bar masters being particularly tricky. 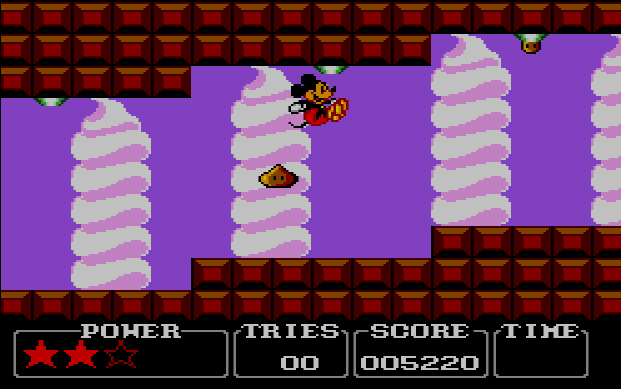 Yes, I said a chocolate bar, as a boss, because each level takes vastly altering Disney cues which are gloriously presented, each assembling a squad of baddies matching their surroundings. In the woodlands you have trees and spitting plants, in the toy realm there are remote control cars and some terrifying clowns! This lends more original fun segments into the fold, such as jumping into a coffee cup via a spoon, or carrying a lantern to light your way. The level design is generally of high quality throughout, as various paths and red-herrings are open at many junctures, with traps and secret passages along the way to discover. It will annoy somewhat that unseen traps cap you off mercilessly, and re-spawn points are limited to one per level, but that’s part of the trial and error factor which this game also includes. To be honest, although near-perfect timing skill is required and a heavy reliance on memory, levels can be conquered quickly by experienced platform virtuosos and as there are only six on offer, replay value can be stunted after all the good stuff has been experienced once or twice. 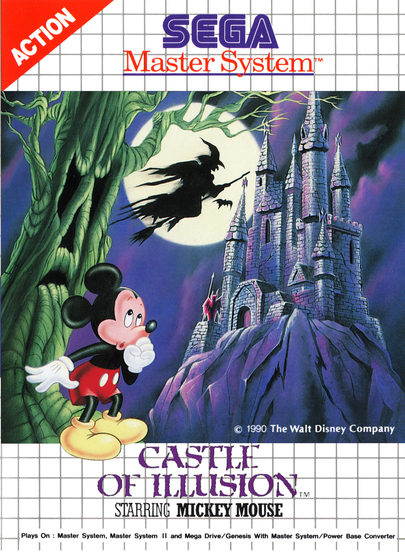 As a series opener, Castle of Illusion is a wonderful visitation into one of Mickey Mouse’s fantastic adventures put into a video game. Whether played on any of the SEGA systems of the era, it’s a real winner for graphical fun, inventive situations, platforming range and of course, some neat music and effects. Each level has its own bouncy background ditty, bosses given the archetypal darker/meaner tone of music, all hitting the 8-bit ‘great’ switch without lapsing into repetitiveness. The sound effects are numerous and fitting, if not adding too much to the theme. The unnecessary ladder climbing sound being the only effect to possibly cause mild irritation due to its frequency. Graphical textures are also seldom to show up on occasion, so it’s little disappointing to see large area’s of solid, flat colour on some stages, sometimes almost spoiling the look. This is a very minor note however, because generally the visuals are bright, faithful and luscious with a beautiful quality of care. 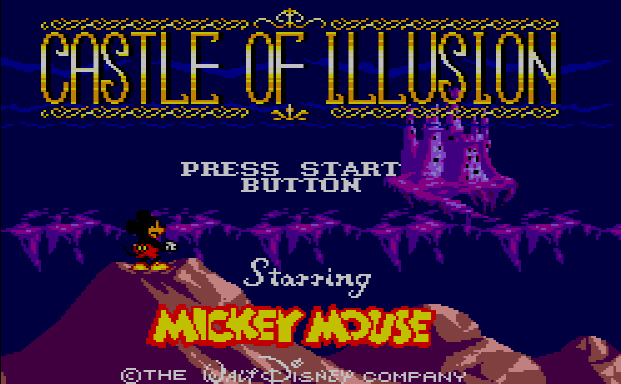 This inevitably makes Castle of Illusion an enormously delightful title highly fit to bare the famous rodent’s name, and spark off a series which, low and behold would receive a new lick of paint 23 years later. It’s no illusion, it's Disney magic!